New York City, The Big Apple, a global hub for innovation and invention from the Otis elevator through the MakerBot 3D printer… The perfect location for teachers to flex their own innovation and invention muscles at Design, Do, Discover 2015. In June 2014, I attended the second Design Do Discover conference at Castilleja School in Palo Alto, CA. This June, the third DDD was held at Marymount School in New York City. Both times, the amazing Angi Chau from Castilleja and Jaymes Dec from Marymount were the fantastic organizers, and both times I was honored to have been asked to participate as a coach to support teams of participant teachers. The first year was a wonderful learning experience for everyone – coaches and participants alike. But this year blew it out of the water. Hit it out of the park. Nailed it on the head. The premise is simple: start with a quick tour of the facility and very brief show-and-tell of the tools (less than 30 minutes! ), follow with a group brainstorming session around project ideas (less than 30 minutes! ), then form groups to jump into projects. Even before lunch on the first day, groups were already sketching and tinkering with Hummingbird Robotics kits, MaKeyMaKeys, cardboard and MakeDo’s, and more. For two days, I jumped in to help groups, learned new tools myself (LittleBits! ), fetched tools and supplies as needed (copper tape! wire strippers! ), recommended resources and suppliers (Sparkfun! DigiKey! ), and acted as cheerleader for teachers pushing themselves to learn incredible new skills and create amazing artifacts of their learning. The final projects blew ALL of us coaches away! The absolute best part, from my perspective, is that every single project was immediately applicable back in the participant’s classroom. Most of them are generally applicable in any learning environment! 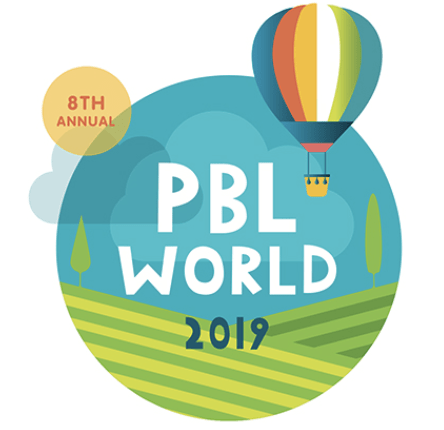 Serious high school science content, literature and history, elementary grades, even social/emotional learning… This was absolutely the most excellent collection of practical and academically-oriented maker projects I’ve seen! This project was created by a team from my own school in Seattle… They were pursuing an idea of presenting the whole school with the same project prompt: solve a problem related to water. Our kindergarten teacher on the team identified a classic kindergarten water problem – water spills on the floor at the sink and water fountain! The group decided to build a Lego Mindstorms robot to automatically clean up those spills. The robot included a motion sensor to activate, and incorporated laser cutting for the adorable turtle form and 3D printing for the optional handle for manual clean-up. Lego MindStorms, Laser cutting (Adobe Illustrator), 3D printing (Tinkercad). Laser cutting (Adobe Illustrator), MaKeyMaKey, Scratch programming, (some might say “excessive”) ambition. This group went all-out to try to use every single tool available. They also endeavored to create a sculpture that would encourage collaboration – in order to activate all of the “D”s, multiple people must work together to activate all of the sensors! Vinyl cutter, 3D printer, laser cutter, MaKeyMaKey, Hummingbird Robotics kit, LittleBits, mechanical gears! This group had an interesting brainstorming process that ended up far from their original plans… they were interested in incorporating learning about animals and habitats, they really wanted to incorporate Hummingbird Robotics kits, they wanted something immediately applicable back at their schools, AND they were interested in wearables. Although I was present for their brainstorming session, I’m still not sure how they got to “Nick Bottom’s Donkey Head,” but the final product was amazing and left me nearly in tears laughing! The mouth and ears are controlled by Hummingbird servos, the eyes are Hummingbird LEDs, and they used the Snap programming system to direct the motion sensor to activate the whole system. Other than that, the whole head is cardboard, felt, and MakeDo connectors! Hummingbird Robotics, MakeDo, cardboard and killer craftsmanship. I worked quite a bit with this group of humanities teachers, most of whom felt very non-techy. They killed it! They used the laser cutter to etch their maps, but then really didn’t know what they wanted to do next… With some brainstorming, they decided to use LEDs to illuminate different critical locations on their maps, and ALSO to use the MaKeyMaKey to give viewers of their maps more information about each of those locations. When a viewer presses one of the buttons, the corresponding location is illuminated and an informational screen pops up via Scratch to teach about that location! Laser cutting, basic circuitry, MaKeyMaKey and Scratch programming, bravery and perseverance. This group was interested in the intersection between technology and storytelling. They developed an digital interactive Snap version of Goldilocks and the Three Little Bears, and a hilarious physical interactive display of the bears themselves. Using the Hummingbird Robotics kit and three light sensors (one for each bear’s bowl of porridge), a viewer can activate each bear to move in a different way. Hummingbird Robotics, extensive Snap programming, Laser cutting, hot glue! This was a deceptively simple little project with some very complex innards… These two teachers programmed an Arduino to take input from two sonar-based distance sensors to send a random compliment (from a set of text strings the group developed) to offer viewers a compliment when they approached the box. The participants who made the Compliment Bot were pretty funny… they kept insisting that the distance sensors actually conducted a retinal scan, the Arduino analyzed the viewers personality, and then the screen printed a compliment specially selected for that viewer. I was almost convinced when the Compliment Bot praised my strength in The Force. Arduino, Laser cutting, a hilarious sense of humor. I didn’t get to chat much with this group, so don’t know many of the details of the project. However, what’s not to love about two aliens who dance with you when you approach? When placed on the two sides of the scale, the viewer can see the heavier weight of the second sentence of the quote, demonstrating the heavier weight of its meaning. A truly beautiful metaphor. Sticks and paperclips, creativity and craftsmanship. This primary art teacher does a class monster-drawing activity with her students regularly, in which each student receives a piece of paper folded into thirds. The student draws the head of a monster on the first third, then passes it to a second student. The second student draws the body of a monster on the second third without seeing the head drawn by the first student! (See where this is going?) The third student draws the legs, then everyone opens the folded paper to see the hilarious mixed-up monsters at the end. She scanned in several of her students’ drawings and converted them to laser-cuttable files with the intent of making the segments even more reconfigurable as stamps! In the picture, you can see the acrylic, heavy cardstock, and MDF trial cuts she ran. Ultimately, she found that etching produced better stamp-ability than cutting. This teacher produced a beautiful and simple work of art using laser cutting and an LED string from a LittleBits kit. If you’ve wondered how to incorporate “making” into high school biology, this teacher had a brilliant idea. She used the laser cutter to created a hinged bacteria chromosome and set it to represent primer sequences to open the chromosome and insert a new gene. Since her classes do transformation with green flourescent protein (GFP), she used copper tape, an LED, and a coin cell battery to illuminate the gene when properly inserted into the plasmid! This group was consistently very focused on design… Their intent was to design and prototype hacks that could be implemented on nearly any standard classroom furniture to improve the flexibility, storage, and usability in a “maker” context. In the pictures below, you can see the “open” and “closed” configurations of the different items: a locking table-extension that reveals tool storage when opened, benches that contain storage compartments, and (my favorite) a bench that opens to reveal project trays, so students can move and store their projects flat without needing to sweep everything into a bin. Laser cutter, vinyl cutter, design thinking! This group was very interested in the idea of creating spaces-within-a-space, or small architectural hacks to offer smaller experiences within the classroom. They brainstormed a wide variety of amazing implementations, like a small domed cave for making cave paintings. The two spaces pictured included the “emotional regulation cubby” (where students can retreat when overstimulated or in need of soothing) and the “private art-viewing booth” (where viewers can view art individually even within a crowded space). MaKeyMaKey, cardboard and glue guns. This teacher identified a problem in her school – iPad implementation was going well, but learning spaces were all too loud for students to make decent voice recordings for their range of video and audio projects! She prototyped a great personal sound booth that folds up neatly for storage, holds the user’s iPad easily, includes a curtain to close off additional sound from behind the user and quiet fan to keep the inside from becoming stifling. The photo and video really do not do the piece justice. Foam and ingenuity, LittleBits, basic circuitry. This team from the Philippines was very interested in examining their school’s disaster preparedness plan, as well as learning as many of the tools as they could. They designed and laser-cut the front facade of their school, and 3D designed and printed a side-building, then sought me out for help with their electronics idea: they wanted to create a feature that would illuminate the pathway to first aid and disaster stations when activated by a user walking by. With little time left, I didn’t think we’d be able to achieve that with a Hummingbird Robotics kit or certainly not with Arduino! However, I’d *just* learned about LittleBits and was confident that system could be used to achieve their goal! As you can see in the picture, they were successful. Laser cutting, 3D printing, LittleBits. This group’s premise was to devise a project template that would incorporate multiple subject areas and focus on using sustainable materials with as few “consumables” as possible. With this in mind, they started by creating a blank template – which they’re sharing here! – that could be used for any lesson/unit design. The example project they built out was a unit around water conservation, demonstrating their proposed format for a fully-integrated unit. In each content area (they chose Math, Social Studies, Science, and English), lessons would be taught with the subject of water being a theme. Math would look at volume, English at poetry, Social Studies at the economics of water control, and Science at actual conservation. As students showed mastery in each subject, they would be asked to build a “button” using a metal bottle cap (water bottle) and other sustainable or recyclable materials. The button must to show the subject area they learned about (ie. Math has a 3D printed “V” for volume). Once the students had made their four buttons, their task in the maker space would be to create a video game around the theme of water conservation in Scratch and use a MaKey MaKey to create a controller for that video game using the buttons! This team’s goal was to create something that could continue to add meaning to making and help teachers to create lessons that would incorporate responsible making in their classrooms, teams, and schools – a goal thoroughly met! 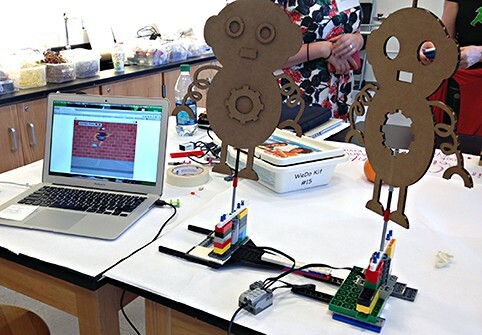 MaKey MaKey, Scratch programming, 3D design and printing, with a little Lego and laser cutting for pizzazz. This conference really shows just how innovative teachers can be when presented with challenges, tools, and a collaborative and supportive atmosphere. Participants ranged in their self-identified experience-levels with the tools from utter novices to experts, but all showed deep expertise in student learning needs and connections to their respective content. This is the sort of learning we should be consistently striving for, both for our students in our own schools but also in our professional development. The learning and growth experienced with this kind of critical thinking, tinkering, and connection-making is what is going to enable us and our students to solve the huge problems that our world is moving towards: poverty, climate change, lost habitat diversity, social injustice, and more. I’m sure it sounds hyperbolic, but the great resilience, collaboration, creativity, empathy, and other skills afforded by “maker education” are precisely the skills needed to change the world. Thank you so much for this comprehensive round up of all the projects! It really was a special conference and we could not have pulled it off without all the talented coaches. Can’t wait for next year! Dear Lindsey….amazing projects! Thanks so much…my mind is swimming with ideas! I am now determined tofight extra hard at budget time for a laser cutter….it’s the last piece missing in our Design Studio!